Discussion in 'UFC Discussion' started by okusa, May 24, 2014. If he doesn't do something stupid like move up to 170, he has all the tools to fairly easily retire undefeated with a good 40+ fights, he already has 22 and he's just a kid. If he gets a title right now he can be the on paper GOAT in 5 years. His grappling and wrestling is too good, no one can hurt him, he's fast, he has a crazy gas tank, and he never stop coming at you. If he doesn't sub or TKO you, he will just technically dominate you. Dos Anjos is as elite as any top 5 LW and he had no chance at any point. Moving up will be the dumbest move Jose Aldo will ever make if he goes through with it. Is there a fantasy thread to post this crap in? His striking needs work but he's an incredible talent. Dos Anjos is as elite as any top 5 LW and he had no chance at any point. No. 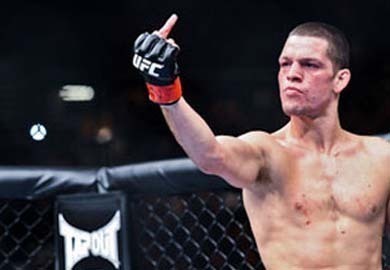 RDA is not on the level of Nate,Thomson,Bendo,Gil,Pettis. Pettis would one kick Khabib. The blonde wig guy is mostly hype. Much closer to a human blanket than a world champion, but maybe someday. He should just retire as GOAT now. No need to actually fight anyone now that you figured this out for us, TS. This thread will be bumped when Khabib suffers his first loss, TS. Yeah, was thinking the same thing. RDA should have lost to Dunham, that's not top 5. Seriously though, the guy isn't ready for someone like Pettis yet. Although it works for him, his striking is still pretty sloppy at times and he has a tendency to over commit. That's a death sentence against someone like Pettis. I think Gil and Bendo would give him alot of problems, too. He is a ridiculously talented grappler, though. i think Khabib has the potential to be the UFC Lightweight champion and defend the belt numerous times. His wrestling/sambo is elite. needs to work on his striking, but he is young and will improve there. Khabib needs one more quality win over a top 10 LW and i think he deserves a shot at the belt. I believe Khabib will be the UFC LW champion in the near future.